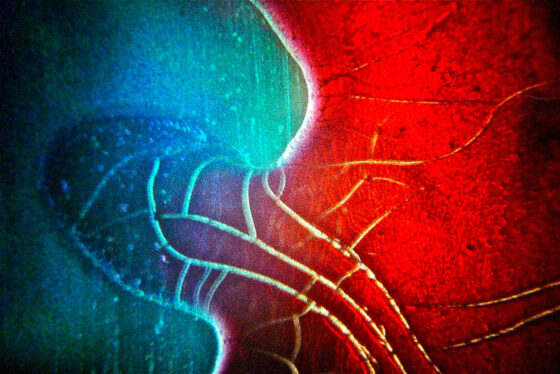 In the decade spanning 1975 to 1985, visual artist Joseph Bernard completed more than 100 films in Super 8mm. Frustrated by a lack of funds, materials, and attention, he withdrew from filmmaking and, ultimately, public art production entirely, though he remained on the faculty at Detroit’s College for Creative Studies, retiring in 2007 as Professor Emeritus. American experimental cinema is considerably poorer for both the brevity and obscurity of his career. Happily, the latter of these issues might now be rectified thanks to the Blu-ray release of Prismatic Music, a collection of 40 of Bernard’s films. Joseph Bernard first heard Stan Brakhage’s name the first time he saw his work: in 1969, while visiting Cummington Community of the Arts as an undergraduate on a work-study grant, he was shown Mothlight (1963) by the painter and filmmaker Abbott Meader. He asked to the see the film a second time, and then a third. By the following year, he was studying with Brakhage—as well as the painter Ray Yoshida and photographer Ken Josephson, both significant influences—in the MFA program at the School of the Art Institute of Chicago. 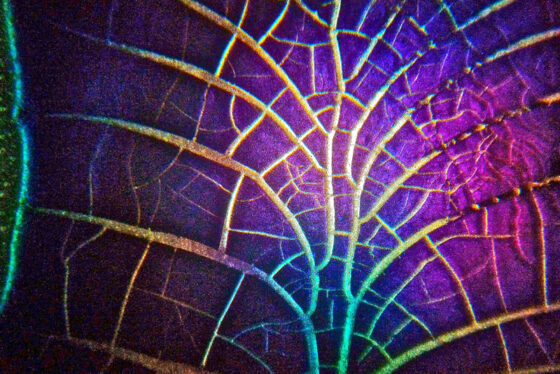 The chief invention of Brakhage’s cameraless films, of which Mothlight is rightfully the most widely known, is the dialectical procedure by which the negation of the frame at an early stage heightens its power tremendously at a later one. That is, by removing it from the moment of production—painting or collaging directly onto film without regard for frame lines—Brakhage creates films in which the frame becomes the dominant formal element. It imposes itself on a flow of material, organizing it for projection at 18 or 24 frames per second. Rather than replicating some rhythm from the world, the film expresses its own. This rhythmic organization is subjectivity, the point from which Brakhage departs on his didactic project to free the visual from the deadening form of language (e.g., you will finally see all the shades that you really see in a field of grass). 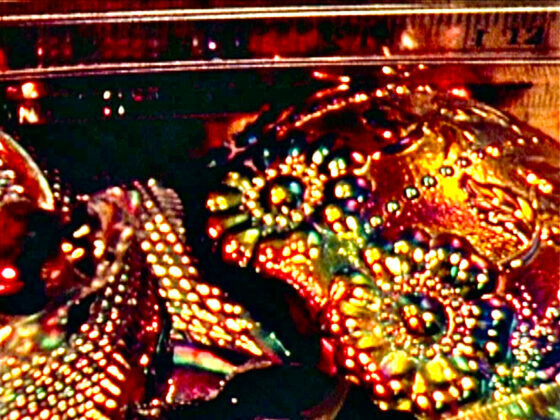 Recent history has provided ample evidence of the failure of this grand project, at least in its utopian aspect: leaving aside the considerable number of Brakhage’s formal developments that have been fully assimilated into contemporary corporate visual language, there is the trouble that these films can never quite be cured of the language infecting them. Still, among American directors, only Griffith, Chaplin, Cassavetes, Frampton, and Markopoulos have done more to expand the formal possibilities available to cinema. Bernard’s films work by taking this pumped-up sense of the frame and returning it to the production process: single-frame and short-frame (i.e., bursts of two-to-six frames which allow movement into the image while still maintaining single-frame photography’s visual “pop”) photography is then subjected to meticulous editing. The result is a frame as forcefully present as that of Mothlight or any of the hand-painted films, but which is overdetermined in such a way that it becomes something other than a form of subjectivity; rather than rhythmic organization, Bernard achieves polyrhythmic freedom. The history of poetry is 40 times as long as that of cinema; the history of painting, nearly 200. Does this explain filmmakers’ relative absence of anxiety over their influences? With so young an art, it remains easy to pick and choose from previous forms and sensibilities, whether from within cinema or without (the benefit of the movies’ status as the “plus one” of the arts, that which extends at once from all of the aesthetic work that has come before it). Bernard betrays no anxiety over Brakhage’s importance to his thinking with cinema; it is a light and wonderful thing to encounter such a confident, generous student. Cinema is a form of impressionism—it was, after all, born at the moment when this style in painting was reaching its greatest heights, and thanks to Bazin, the two seem unlikely to ever be fully separated. Its impression is automatic: the machine, lacking the painter’s memory, must work with absolute speed. But then can there truly be a cinematic expressionism? The Germans and perhaps a few high colourists of the late Hollywood era have come closest, but the distance between even these works and those of the expressionists in painting, particularly the abstract expressionists, is considerable for the simple fact of the dramatic narrative, the world-building which demands that all effects be traced clearly to a psychological root. Bernard’s films have no concern for psychology and so are able to achieve something like a cinematic all-over effect. In her appreciation of Variant Chants (1983) written for the small catalogue that accompanies Prismatic Music, filmmaker Monica Saviron invokes the abstract expressionists Joan Mitchell (“emotional charge of…brushstrokes”) and Jackson Pollock (“chaotic pouring of accumulated textures”), as well as their contemporaries in poetry, particularly Frank O’Hara and his “percussive associations.” Despite working from the relative seclusion of Detroit, Bernard may in fact be the filmmaker who has carried the various styles of the New York School the furthest in cinema. Like Schuyler, Bernard is an extraordinary colourist of the everyday, one capable of maintaining a visual balance not only within the frame, but across the whole of the film. Each film has a dominant colour—the curtain-filtered white light of Chamber’s (1977) domestic spaces; the tart cherry of Ritual’s (1979) macro abstractions; the twilight blue that keeps Night Mix (1982) attached to the day. These dominant colours are accented by Bernard’s extensive manipulations, through painting, inking, bleaching, scratching, etc., which bring in his “violent green,” his “bright particular.” (In certain cases, such as Night Mix, the manipulation itself provides the dominant colour and the photography fills out the palette). The clearest example of Bernard’s structuring use of colour comes in Eye Reels (1980), which works in the negative space left behind by the pooling of red in the cardinal dresses of an Irish dance performance. Schuyler once wrote of the “blue-occluded white” in Paul Burlin’s Square White. In Eye Reels, Bernard renders a red-occluded world full of pleasant natural hues—white, green, brown—striving for the excitement that only lives in red. Eye Reels is notable as well as the only of Bernard’s films to make significant use of found footage: it opens with rickety images of a nuclear explosion and what appears to be a civil rights event. The avoidance of found material is somewhat surprising given the collage nature of his films (and the actual collages he made across his career, many of which figure in his films), but the truth is that he prefers the sensibility that attaches to found objects to the objects themselves. This sensibility—Bernard’s sensibility as a photographer—is one of excited disinterest. At any time, he could just as well be filming something else, but he’s not, he’s filming this. Such a sensibility depends on the belief that anything might be found beautiful if looked at properly. It is not a case of degrading the beautiful by passively finding it everywhere one looks, but rather an active engagement with the notion of natural beauty itself, an engagement that depends on Bernard’s intricate montage to reach its full expression: he is not interested in simply presenting semblances, he is after the harmonious relations that make up the perfect beauty of the whole of the world. A nervous zoom out from a man walking across an empty lot may not be beautiful in itself, but placed as it is in Ritual—as the moment in which the tight focus of tabletop filmmaking finally opens onto the world—it gains a humble splendour. So then the beauty of Bernard’s films resides in their rhythms, and their rhythms are mercifully left free of any obligation to sound, as all of his work is silent. At a time when experimental film programs around the world are drowning in soundtracks which exist solely to avoid the weight of silence, Prismatic Music offers a desperately necessary corrective: editing done with real rhythmic sensitivity and invention has no need for the pleasing sonic illusion of synchronicity. As with Jonas Mekas’ films, Bernard’s are a type of silent diary. In both cases, there is the question of what knowledge a silent diary can provide. Against the “I did this, I did that” quality of Mekas’ work—work which is, at its best, terribly moving for his sensitivity to the glancing moments when a face finally gives up its secrets—Bernard is only secondarily concerned with a documentary aspect, with the possibility that in the future a viewer will know that this thing happened. Where Mekas builds up documentary moments while patiently waiting for the moment for an artistic gesture, Bernard views art as continuous with the world: to reiterate, the nothing days of daily life are quite simply the stuff of art if one is willing to work out the fragile, subtle relations running through everything. His are films that enact the critical position of rejecting any possibility of detachable content. The documentary aspect of Bernard’s films is at its least disinterested in his portrait films, which include both people—his mother (A.B. Portraits, 1978), or his daughter (JSB at 9 , a somewhat queasy essay on the trouble of the male gaze as directed at one’s own child)—and places, ranging in scale from the town (Provincetown Pieces, 1979) to the home (620 Commercial, 1980). His attention remains as quick as ever, but these are the rare instances where the answer to the question, “What is it about?” is made immediately available. Human figures nonetheless appear in nearly all of Bernard’s films. Their aspect is generally that of home movie: because these are often his friends and family, they are able to act “naturally” in the presence of his camera, acknowledging it as an extension of Bernard himself. Again, the effect is closer to the friendly hangouts that fill Mekas’ rolls than the posed figures one finds in the films of Brakhage, or the underground lounging in the films of Ken Jacobs, Jack Smith, or the Kuchars. Bernard’s final film, Her Moves (1985), signals a significant shift away from all of the films that preceded it. Here, at last, there is performance: a dozen women each perform a single task for the camera—walking a dog, playing a cello, serving a tennis ball, dancing ballet, and, perhaps in the most mysterious instance, appearing in a film. There is the sense of Muybridge in reverse; having spent a decade de- and recomposing the world to bring forth its relations with maximum clarity, Bernard now turns his attention to motion as such, allowing illusionist movement back into the image while retaining an all-over rhythmic quality. It is his strangest, his most overtly political, and his most conventional film. Another figure demands consideration: that of Joseph Bernard himself. The pleasures of incidental self-portraiture have long sustained the American avant-garde, and Bernard, with the flowing hair and broad chest of an All-American quarterback, appears across his films. He is almost always shown at work, either filming his own reflection, or seated at the editing bench. Experimental filmmakers today seem content to stay behind the camera, signalling the reflexive fact of living their films via symbolic means, if at all. The sensibility that leads to more direct cinematic self-portraiture, such as that of Anne Charlotte Robertson, or, again, Mekas, seems to have migrated comfortably to the digital spaces of Instagram and YouTube. Bernard’s cinematic breakthrough, Chamber, opens on an image of the camera in front of a window reflected in a detail from Bernard’s combine of the same name, which ultimately serves as something like Stevens’ jar, an object of such plain gravity that it is capable of drawing anything and everything into its domain, until the space of the film—the Bernard family home, with its knickknacks, photos (Maya Deren haunts the film via a still from Meshes of the Afternoon ), X-rays, dogs, snowy yards, light fixtures, children, bedrooms, etc.—seems to live inside this art object. Bernard takes up what Krauss sees as the modernist deployment of the window at the hands of the symbolists—“the window is experienced as simultaneously transparent and opaque”—but torques its use to become not a marker of the distance between art and reality, but a formal corollary in the world for the modernist mechanics of his art. As evidenced by the key image from Chamber, Bernard fully understands the window in its opaque dimension, i.e., the window as mirror. At times, he introduces actual mirrors, sometimes using them to split the frame in two, creating a 360-degree vantage on the flat plane of the image. At others, he films windows themselves opaquely, whether through the use of lighting or perspective. In either case, the autonomy of art that the grid introduces is worked over until it dissolves into a natural harmony; the aesthetic effects of the grid remain in place, but art, in its autonomy, has turned to once again face nature square on. 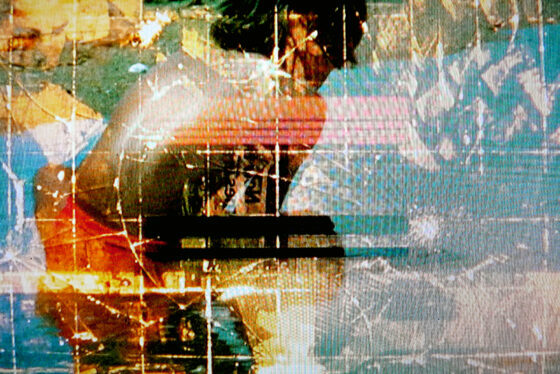 The grid occurs throughout Bernard’s films in literal forms as well, most commonly as the backing on his typewritten titles and signature, which serve as effectively as a précis for his sensibility as Brakhage’s hand-scribbled “by brakhage” or Frampton’s HF logo, with its conflation of language and image. In addition to windows/mirrors and grids, the third of Bernard’s pet objects is the geometric device: the ruler, compass, or protractor. These objects appear repeatedly in his tabletop films, and are the only symbols which occur in his work, though they also serve a rhythmic purpose, allowing for a pleasing play between curves and lines (Ritual, Film for Untitled Viewer , Variant Chants). Krauss cites Mallarmé’s comment that the window is the “sign by which he could…project the ‘crystallization of reality into art.’” For Bernard, the geometric device signals the potential for art: to measure difference within the whole that is nature. His tool for doing so, as I have said, is free rhythm and its ability to draw out new cinematic relations. Bernard’s films do not function on the principle that each image must relate to the one which came before or after it; instead, in their rapid appearance and disappearance, they leave both mental and perceptive afterimages, images which work against cinema’s logic of linear accumulation in order to build webs of relations in which each point (image) contains infinite potential. Bernard achieves something like the creation of this new cinematic substance in Variant Chants, the most baroque of his tabletop films, which he describes as an “in-total dervish dance.” Brimming with strange images—pictures from sea adventure magazines are trapped behind gridded rulers; light shifts through and around plastic objects filmed in extreme close-up; images of nature are shot through a prismatic lens, diffracting objects out into rainbow-frayed edges—and the most intricate painting and inking of any of his films, it is impossible to speak of Variant Chants as a film of anything. In it, Bernard has found a film form capable of capturing the world at full complexity; it simply is, indivisibly so. The complement to the sprawl of Variant Chants is found in the compact Ritual, a dark, cultic work where the aforementioned cherry red shines out of darkness at times illuminated from the other direction as well (the ritual might be that of Orpheus, or Dante). Here Bernard makes significant use of his fourth visual trope: letters filmed in close-up, rendering them purely graphic—the curves of letters appear as if radiant, casting off an orange glow echoed by the embers of a fire which appears late in this brief film. Bernard’s third masterpiece, Film for Untitled Viewer, tests the rhythmic and graphic capacities of the written word. Addressed to a viewer who is at once eidolon and everyman, it submits language (and the grid, on which the typed word of its lyric appear) to a series of rapid edits; in the presence of immediately “legible” images, one feels the speed of Bernard’s montage even more. To see Film for Untitled Viewer is to become absolutely aware of just how deeply in the dark one remains as a viewer: the film ends with a single word, “US,” but it remains impossible to know with certainty whether you are part of this us. In either case, it’s one of the only films I know that treats its audience as fully heterogeneous. Film for Untitled Viewer makes apparent the nuance at the core of all of Bernard’s films: in a linguistic society, there’s no returning to Eden, so language—both as language and as the indexical image, with its obvious linguistic dimension (e.g., is that a picture of a nose or a face? )—must be allowed in and then stretched and compacted to see ways in which we might see around and through it. If narrative is inevitable—and I am inclined to agree that, at the time of this writing, it remains so—then where does it exist in relation to a film? Bernard’s films are in a sense études for memory, exercises aimed at helping us to better understand how and why we take in and remember this image and not that one. The new substance which they give to a set of relations exists only for the duration of their projection; afterward, I find myself constantly left with the sense of a whole that is impossible to describe—that is, every image is granted the full freedom of its full difference, a process which is rare and strange to encounter in action. Bernard’s films point to nothing less than a new horizon for film. By accepting the difference-potential in each cinema image, we are now free to throw off the shackles that have bound cinema since more or less the beginning, and certainly since the advent of sound; I mean, of course, the homogenizing force of 24 frames per second. We can now imagine a film of absolute difference even at this most basic level, darting between frame rates in both photography and projection, finally and fully exploring the rhythmic, relational possibilities available to motion pictures.